These owners of Phillips Fiber Art are two hard working partners. Phillips Fiber Art has been Cheryl's full time job for over 20 years and Gary traded his 9-5 in about 13 years ago. Supported by friends and family, they have found success together. Gary moved around quite a bit as a kid. He was born in Montana and graduated from high school in California, then spent a summer in Guam with his mom after high school. A graduate of Mesa College in automotive technology, Gary's worked on cars and other machines for many years. He's handy and always ready for a challenge. Cheryl has always lived in Colorado, but in many different areas. She has a bachelors degree in Geology and is always seeing the patterns in geological formations. A few months after I was born, she gave up her career to stay at home with me and my sister. Having a knack for mathematics, quilt design was a natural progression for her. Finding ways to make extra money she turned her quilting hobby into a career. Cheryl's first book "Quilts Without Corners" was first published in 1993 by a local Colorado company. She then wrote and self-published WedgeWorks, WedgeWorks II and many others. 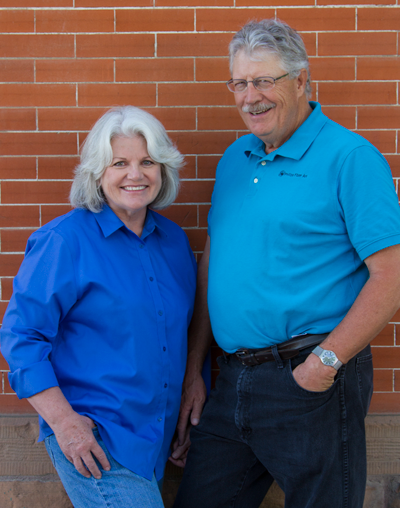 Gary and Cheryl have worked as a team to develop and manufacture an assortment of acrylic quilting tools. God has blessed our family. I am so proud of my parents and honored to be their daughter.